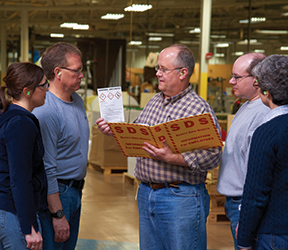 Employers were required to complete employee training on the label elements and safety data sheet (SDS) format when the hazard communication rule was finalized several years ago. It’s likely that workers were confused and overwhelmed with all of the new required training and related information at the time. As a result, your employees may not understand HazCom as they should. Do you know how effective your training was? To be effective, HazCom training must help your workers comprehend the hazards in the workplace and ways they can protect themselves. OSHA does not expect that workers be able to recall and recite all data provided about each hazardous chemical in their workplace. What is most important is that your workers understand that they are exposed to hazardous chemicals, know how to read labels and SDSs, and have a general understanding of what information is provided in these documents, and how to access these tools. OSHA requires that you present information in a manner and language that employees can understand. If you usually communicate work instructions or other workplace information to employees in a language other than English, then you must have also provided safety and health training to employees in the same manner. Similarly, if the employee’s vocabulary is limited, the training must have accounted for that limitation. By the same token, if employees are not literate, telling them to read training materials will not satisfy the employer’s training obligation. You can use any type of media available to you (e.g., slides, videos, computer interactive programs). Combinations of media are often an effective way to keep workers’ attention. In addition, active participation is important, including learning activities that allow the workers to participate and have hands-on experiences. Relating the information to their specific workplace conditions helps to ensure that you meet the requirements of the standard, as well as improving learning and making the training more interesting. OSHA does not require that hazard communication training be repeated on a regular basis, but it must be done at the time of their initial job assignment, and whenever a new physical or health hazard the employees have not previously been trained about is introduced into their work area. This could happen when a new chemical is purchased or reformulated. This is why it’s critical to ensure that SDSs are carefully reviewed when received. Also, refresher training is important when you want to be sure that workers remember what they have learned. Over time, workers may forget critical aspects of their training, so reminders in the form of refresher training may be useful. You may observe work behaviors that would alert you to the need for refresher training. Again, it’s likely that workers were confused and overwhelmed with all of the new requirements and related information at the time the HazCom standard was finalized several years ago. Ask yourself: Has anything changed in our workplace which could have impacted our written program, and thus worker training? If so, refresher training is needed. This is a good opportunity to review your hazard communication program itself, and consider if you have any additional learning objectives you would like to accomplish through this training program. For example, you may also have compliance obligations for related standards that could be combined into this program and accomplished in one training session (e.g., training required under the Respiratory Protection Standard). Also, trainers should use their own impressions as well as feedback from workers to improve the training before it is presented again. If workers are not interested in the training as it is conducted, do not appear motivated, and do not exhibit an increased knowledge of hazards and the use of protective practices, it may be necessary to review and revise the training to achieve better comprehension, retention, etc. Keep in mind that when assessing an employer’s compliance with hazard communication training requirements, an OSHA inspector will talk to workers to determine if they have received training, if they know they are exposed to hazardous chemicals, and if they know where to obtain substance-specific information on labels and SDSs. Are you confident your training was effective? The Hazard Communication Compliance manual provides comprehensive, easy-to-understand guidance on all the key operational aspects for communicating chemical hazards. Click here to take a free trial.